Fantastic Beasts and Where To Find Them is a prequel of sorts to the Harry Potter films and, fortunately for viewers, every bit as delightful. It continues the trend whereby these films always have something going on - either visually or narratively, or both - and we can't help but get swept up by their energy and whimsy, often forgetting that someone, in this case writer J.K. Rowling, actually conjured up these ideas. Like the best fantasy tales, Fantastic Beasts forces us to abandon all disbelief and simply surrender to its magical world. In the time-honored tradition of the Harry Potter universe, an evil wizard named Gellert Grindelwald is on the loose and has ambitions, like all Dark Lords, it seems, to bring members of the non-magical community, deemed “No-Majs,” to justice for their persecution of wizards and witches. Could Grindelwald be linked to the recent string of destructive, unexplained phenomena happening in New York City, what one witness describes as, “a dark wind with white eyes,” which topples buildings and neighborhoods? 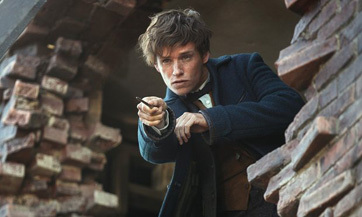 That's one of the questions Newt Scamander (Eddie Redmayne), a plucky but prone-to-trouble wizard out of Hogwarts, eventually sets out to answer. He arrives in New York City from London in 1926 with a suitcase full of magical creatures, which he believes are misunderstood and have been unfairly treated and ostracized. He's writing a textbook about them and feels compelled to provide the monsters sanctuary, and in fact one of the main reasons for his visit to the States is to set free a thunderbird named Frank in the deserts of Arizona. However, once Newt learns more about the war brewing between Majs and No-Majs, not to mention the inexplicable dark force tearing up Manhattan, he acquires an even greater purpose. Upon his arrival, Newt passes by an organized, anti-Maj demonstration headed by Mary Lou Barebone (Samantha Morton), who runs a somewhat twisted orphanage and preaches about the dangers of wizards and witches who are secretly living among them. She believes they're responsible for the recent violent incidents and seeks the help of a powerful newspaper mogul named Shaw (Jon Voight) and his son, Henry (Josh Cowdery), a U.S. Senator, so that they might use their influence to unearth, capture and eventually destroy all magic practitioners.